Being a fan of Schwarzenegger`s for many years now, I was very happy to hear that this "Collateral Damage", would see Arnold return to his roots in terms of action/adventure. After the under-rated "The Sixth Day", I had hoped Collateral Damage would continue the good run that I feel Arnold has had, even though many continue to bad mouth the "Austrian Oak", mainly pointing out his acting skills. I dont expect Arnold to be picking up the best actor award in the near future, but then that is not what his films are about anyways, it`s about how much of a screen presence he has, and how great he is in action roles. The timing of Collateral Damage couldnt have been worse, with the main subject of the film focussing on `terrorism`, the awful events that unfolded on September 11th, meant that the release of a film such as Collateral Damage would be a very bad idea, showing no respect or care to the families who suffered such losses on that sad day. After careful planning and talks, the film was given a release date for early 2002. 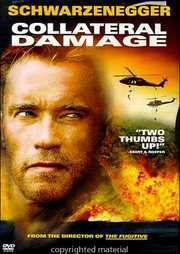 In Collateral Damage Arnold plays the role of "Gordy Brewer", a fire-fighter who tragically loses his wife and son to a terrorist attack. Officials investigating the bombing warn him not to get involved, but with the loss of his family "Brewer" decides to seek out the terrorist responsible for his wife and son`s death, and so he sets off from L.A. to Colombia where it is believed his family`s murderer El Lobo is situated. I found Schwarzenegger`s acting in this film very believable, especially scenes which show his character mourning after the loss of his family. The story itself is strong, with the odd surprise thrown in for good measure. Collateral Damage is presented in a very strong Anamorphic transfer, showing an excellent range of colour, with no signs of marks etc. The crisp Dolby Digital 5.1 mix is loud and cutting, while being pleasantly subtle in the quieter moments of the film. Overall an excellent presentation. You get a feature length commentry from director Andrew Davis, two documentaries "behind the scenes" and "the hero in a new era", the latter mentioning the events of 9/11, a few additional scenes and cast/director film highlights. I felt that Collateral Damage is one of Mr.Schwarzeneggers finest hours, up there with Terminator 1 & 2, and that if he continues to make films such as this, then it will hopefully be only a matter of time before he gets the recognition he deserves. Arnold`s next film? : T3 Rise Of The Machines!.